Soup warms the soul. It’s just what I need when the weather starts to change, as fall starts to creep back. It’s crunching leaves, crisp breezes, and harvest. I needed a recipe for the tons of butternut squash I just processed. Soup called to me, and this was the one! I just sort of threw things together, tasting as I went. This is the recipe I ended up with, loosely based on a recipe I once made long ago (but I can’t remember who to give credit to). It’s sweet and savory, smooth and satisfying. Enjoy! Soup: Cook butternut squash by preferred method. Scoop squash meat out of skins, mash and set aside. In a large pot, heat oil on medium heat. Add onions and apples and cook for 1 minute. Add chicken broth. Cook, stirring occasionally, until apples and onions are soft. Add curry powder and butternut squash puree. Cook for another 5 minutes to blend flavors. Blend the soup with an immersion hand blender or in batches in a conventional blender. add sea salt and pepper to taste. Serve warm with toppings. Coconut Creme: Hand mix or blend coconut milk and yogurt together. Drizzle over warm soup to bring this delicious dish to the next level! 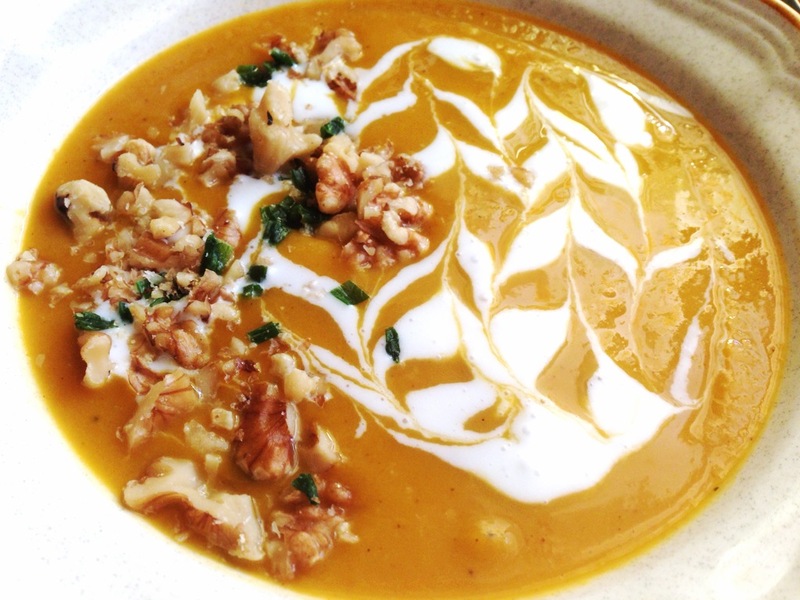 Optional additional toppings: Roasted nuts (walnuts pictured), toasted coconut flakes, chives (pictured), seasoned croutons or chunks of hearty (slightly) stale bread, fried shallots or leeks, pumpkin seeds or pine nuts, shredded apple… anything that offers this smooth soup a bit of a crunch will help with the texture. *I receive no compensation for sharing links to products or pages. I just want to help you know what to look for when you’re out shopping, especially in this instance. Coconut milk also comes in a carton. What I used here is a canned coconut milk. It’s thicker and tastes a bit less sweet. I hope you enjoy this delicious soup. Let us know what you topped yours with! If you’ve never oven roasted a vegetable, you’re missing the sweet, caramelizing, roasty-toasty goodness that graces my table on a near-daily basis. Roasting highlights the natural flavors of veggies so well. Some of my favorite veggies to roast are asparagus, broccoli, kale, eggplant, potatoes, carrots, any type of squash, beets, onions and peppers, brussels sprouts, and of course… cauliflower. 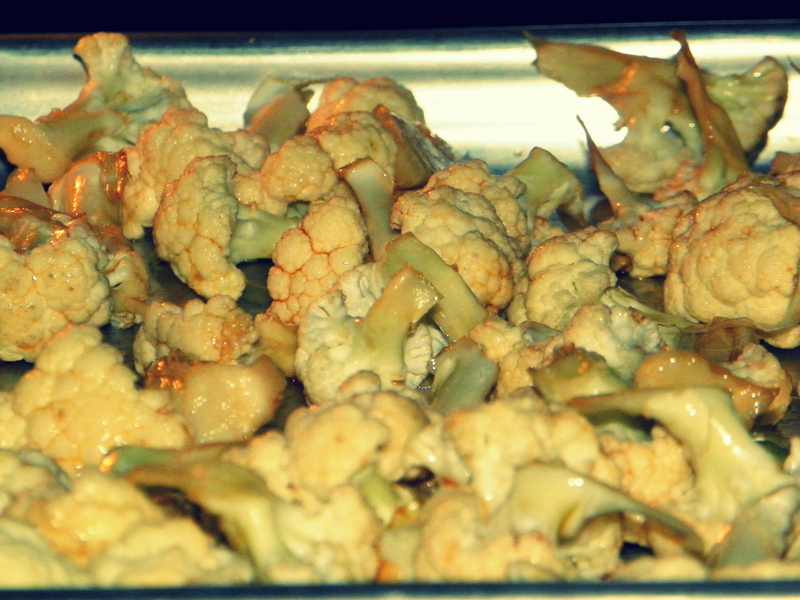 Roasting veggies is just about the easiest of all kitchen preparations. All you need is a vegetable you already love, or even one you sort of tolerate. Add a little salt, some oil, and any number of added flavors (if you wish) and you have something really special to put on your table. My husband spent a two-year mission in Northern Japan and then he took me there on our honeymoon so Asian flavors are usually our choice. But be playful with it and I’m sure you’ll always be impressed with what you end up with. Pull cauliflower into bite-sized pieces. In a bowl, toss to coat with the other ingredients. Place on preheated baking sheet in 350 degree F oven. Bake for 20-30 minutes, depending on your caramelization preferences, turning once or twice. 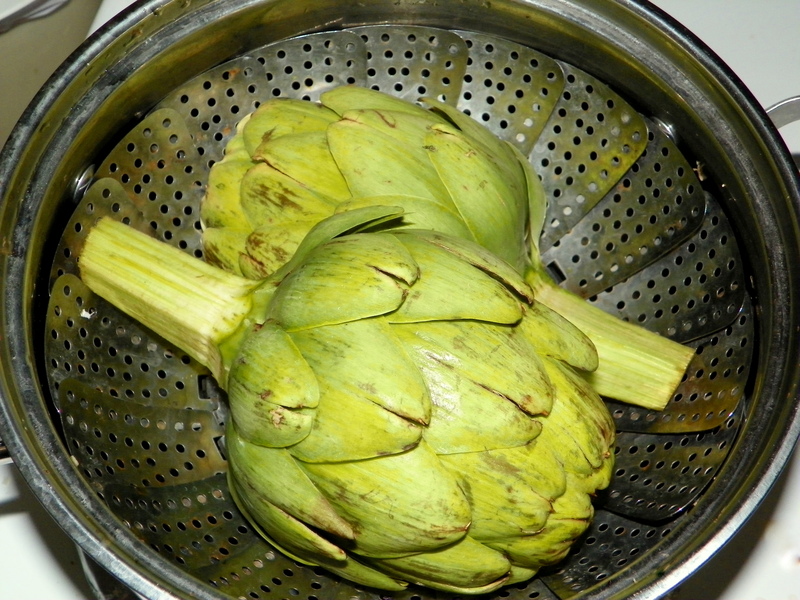 I’m always surprised when I talk to people who don’t know what to do with an artichoke. 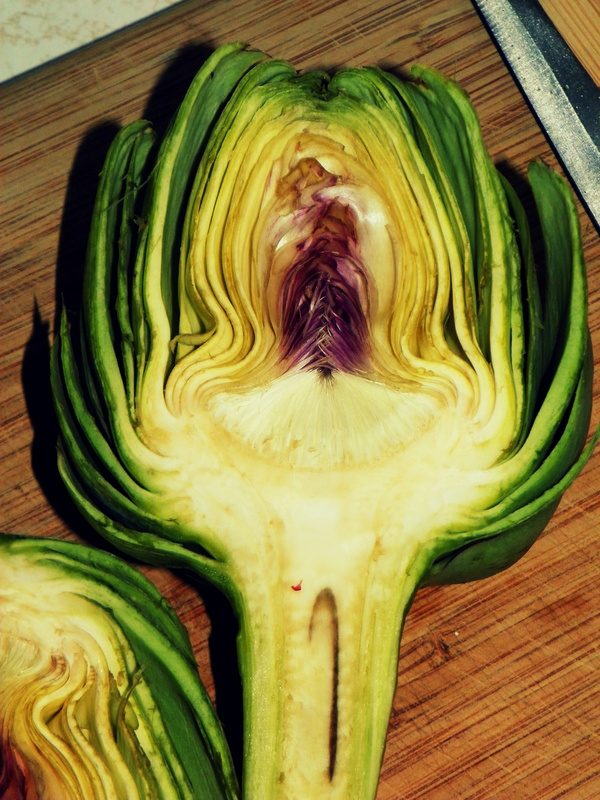 When I was a kid my mom would make artichokes like this for a special treat. Artichokes taste like home to me. They bring memories of sitting around the table for hours sharing space and life over food – something my family is very fond of. 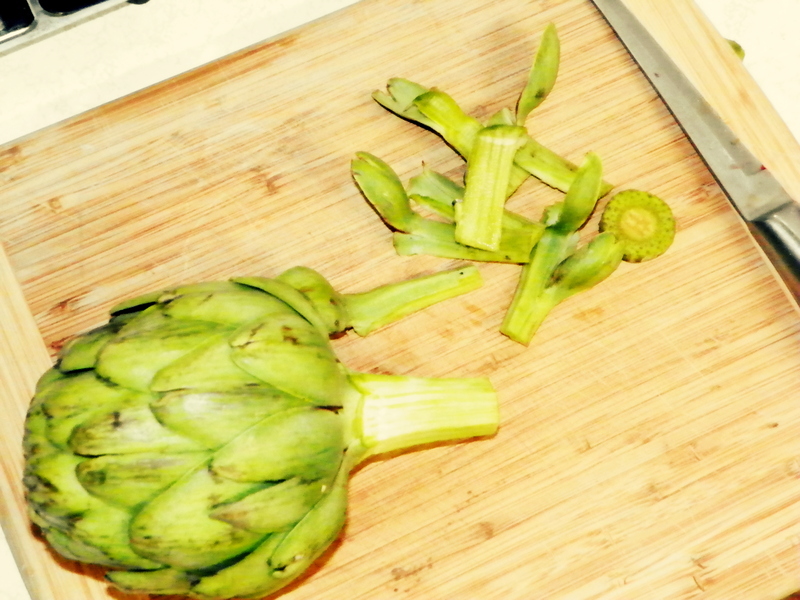 So here is how I make steamed artichokes. Cut off the bottom and shave off the tough leaves and the outer, more fibrous layer of the stem. Then cut it in half lengthwise. Artichokes are just really big, edible thistles. When you cut it open, you can see a glimpse of it’s cousin. The hairy, innermost part, the “choke,” is inedible. I used to remove it with a spoon. You can do this but I found that I removed the soft purple leaves as well and that’s good food wasted! So I just cook it as-is and remove the thistle-y fibers when I get to them as I eat. Some people also cut off the tips of the leaves because sometimes they can have a really poky spine or thorn at the tip. Mine wasn’t so bad so I skipped this step. But I have seen some gnarly artichokes that would leave you feeling like you just fought a velociraptor (or a toddler with un-cut fingernails!) Keep it in mind and make your choice wisely. Some people also cook them whole. But I think they cook a bit faster when cut in half and then they’re the perfect size to share (if you can handle sharing). Steam in whatever set-up you have for steaming. Mine is a pot with a steamer basket and a lid. 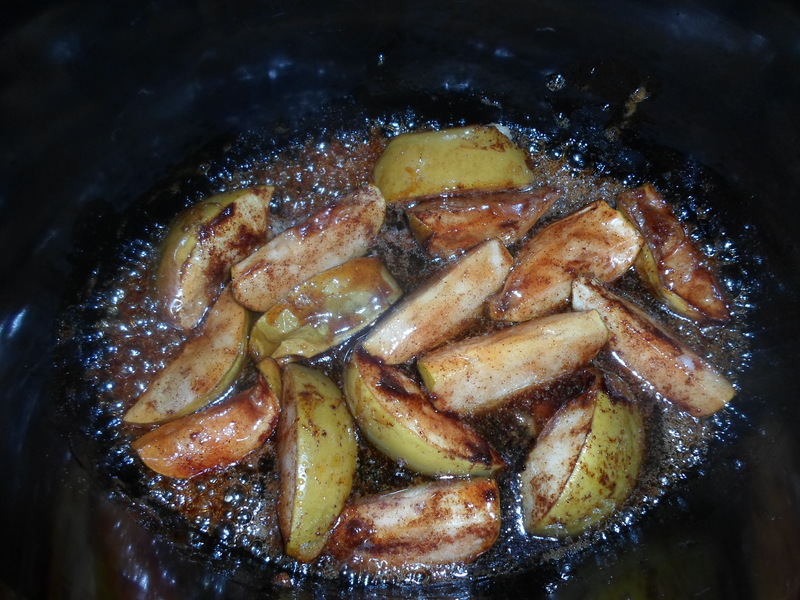 Boil these for about 25 – 45 minutes. They are ready to eat when one of the outermost leaves pulls off easily and tastes done; tender, but not so soft it’s mushy. To eat, just remove one leaf at a time. Scrape each leaf along your bottom teeth to remove the soft flesh on the inside curve of the leaf. You can dip them in all sorts of stuff, from garlic butter to aioli, but I like mine plain… sometimes with a sprinkle of sea salt. This is what we had for dinner tonight. My heart on a plate! 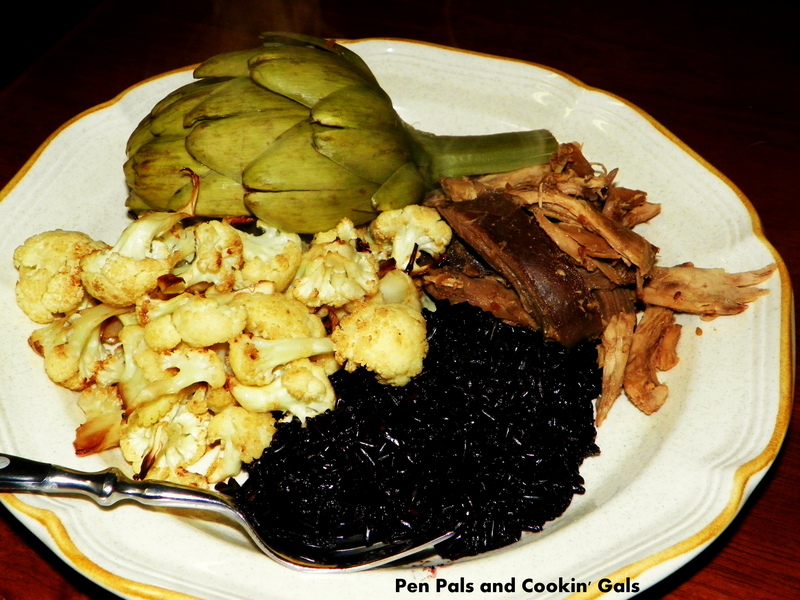 Counterclockwise: Delicious, steamed artichoke; sweet and savory roasted, Asian-style cauliflower; beautiful, nutty, black forbidden rice; and teriyaki-flavored pheasant and grouse breast that my husband shot last year here in Montana. My Mont-Asian meal was a real hit here with all my peeps. What did you have for dinner? 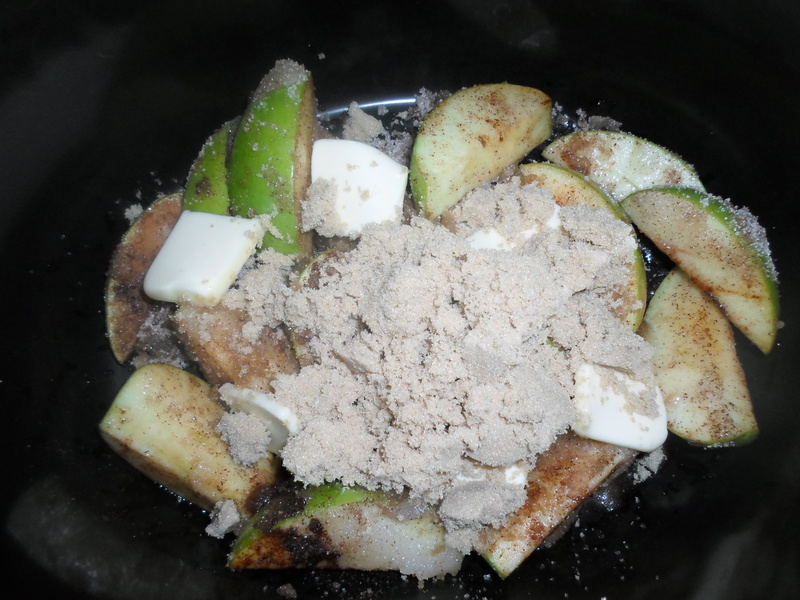 I made baked apples and sugar cookie dough one night to take over for a dinner date with good friends. I was in charge of bringing the dessert. So, I thought about making my baked apples to top vanilla ice cream with a nice sugar cookie on the side. Oh, that sounds It was so good let me tell you. 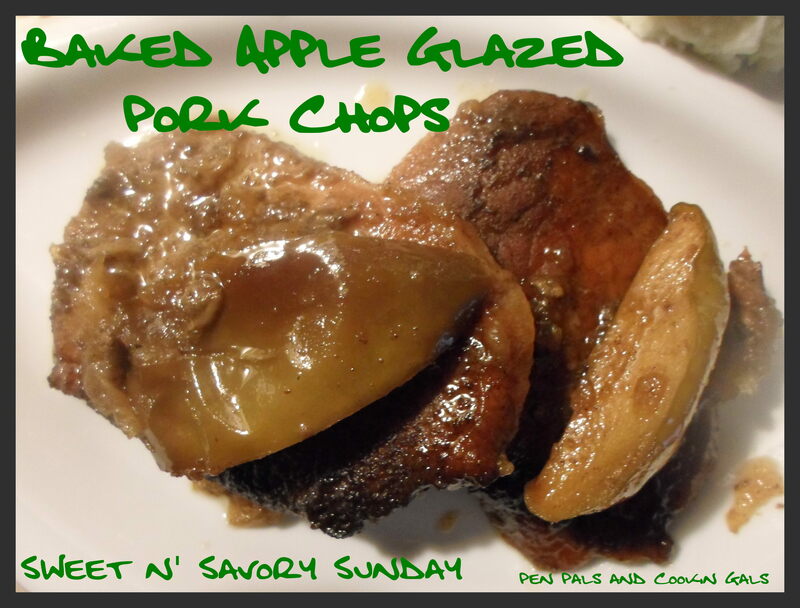 Well, they are foodies to, and they said I should try my baked apples on pork chops. Well thats were this recipe falls into place. I make this in the crock pot so everything is easy. I start with 2 Granny Smith apples washed. You can peel them if you want, I like to keep the skins on to help the apples stay together longer. After a few hours they will bake down to look like this. Delicious! 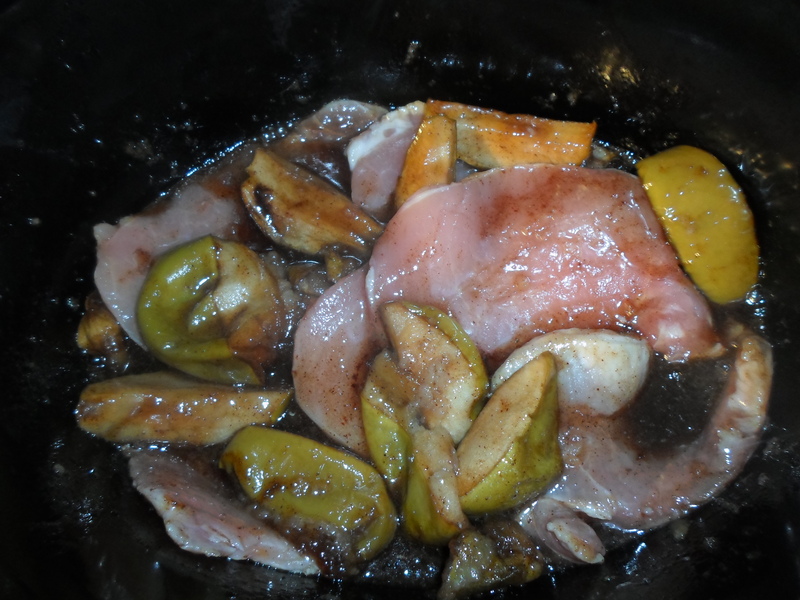 Then add your pork chops to the apples. I used thin cut pork chops. 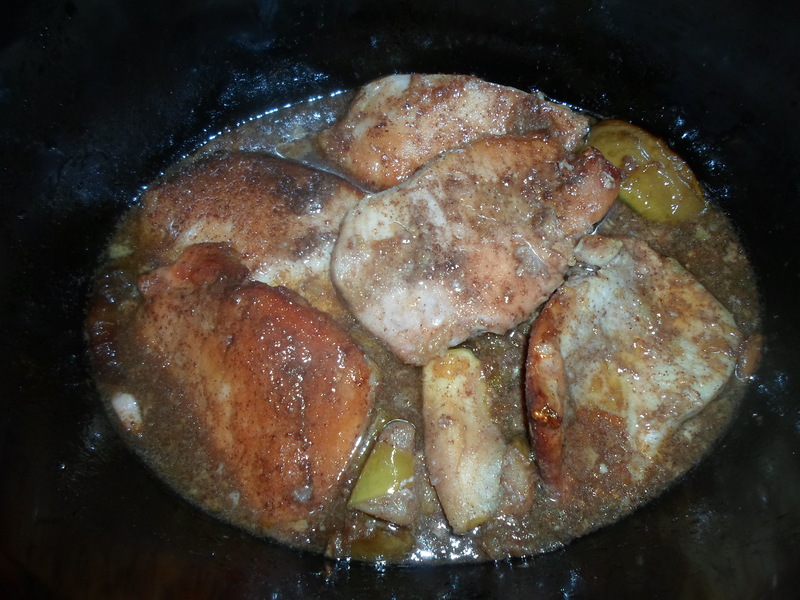 I think if you were to use thick cut chops it would be best to add the pork chops in before the apples are done. That way the apples don’t completely break down to apple sauce by the time the chops are ready. So after a couple of hours on low your chops will be done. They will be so tender they will fall apart with ease. So go easy when you pull them out. These are the best pork chop I have ever tasted. I think all chops should be done like this. I choose to serve them with mashed potatoes with homemade brown gravy and corn. So, I hope you enjoy them as much as we all did.